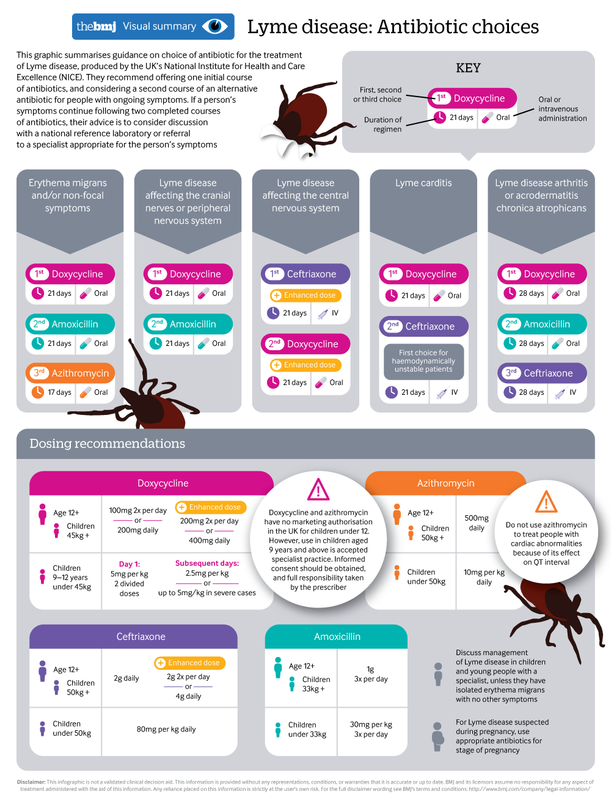 Re: Lyme disease: summary of NICE guidance. Diagnosis: do the guidelines pass the test? In accordance with current practice, NICE advise: “Diagnose Lyme disease in people with erythema migrans”. This advice ensures that some patients will receive timely treatment for their infection. NICE do not indicate how many patients this might apply to. This unique investigation suggests that only 25% of infected patients will report an EM rash. Higher estimates for the incidence of EM rash can be presumed to be inflated. When it occurs, EM rash is usually the only specific visible sign of Lyme disease and when present with symptoms, is much more likely to lead to diagnosis, biasing the incidence. The NICE guideline does not indicate the frequency of EM rash, but leaves doctors to guess to what extent they should expect this sign to be present. For patients without an EM rash the NICE guideline makes laboratory confirmation of the infection obligatory for diagnosis and treatment. This requirement can only be justified if laboratory testing is highly reliable, otherwise infected patients will inevitably remain untreated, with all the risks that entails for their future health. The draft version of the NICE guideline contained egregiously misleading claims about the accuracy of testing for Lyme disease. (5) These were removed in the final version, possibly as a result of VIRAS and others objecting. (6) However, the guideline still does not warn doctors about the unreliability of serology. The testing recommended by NICE actually achieves sensitivity of only around 41% to 55%. (2,3) This degree of unreliability has not been communicated to doctors, who will quite reasonably infer from the guideline that the tests are reliable. The inference is simple: NICE would not require doctors and patients to depend on serological testing, unless those tests were highly reliable. The guideline provides one statement which could conceivably be interpreted as cautionary: “1.2.24 Tell people that tests for Lyme disease have limitations. Explain that both false positive and false-negative results can occur and what this means”. This instruction is actually useless to doctors, who cannot explain ‘what this means’ to their patients, if they do not have Sensitivity and Specificity figures or meaningful estimates, which the NICE guideline does not provide. The Rare and Imported Pathogens Laboratory (RIPL), is the Lyme reference laboratory under Public Health England (PHE). The first-tier screening-test they use for Lyme disease is the Immunetics C6 Lyme ELISA IgM/IgG test. The Immunetics user manual for this test indicates that its Sensitivity in predetermined cases of Lyme disease is 75%. (2) Therefore the screening test which NICE recommends, will return False Negative results for at least 25% of infected patients. A screening test has one very simple requirement: it must detect close to 100% of true cases. It does not matter if a screening test returns numerous False-Positive results because these will be eliminated by the second tier test. But a screening-test should eliminate only a minimal number of true cases, otherwise it increases the risk of missed or delayed diagnosis, thereby depriving patients of necessary treatment. According to the Immunetics manual, when a positive ELISA is followed by an immunoblot (as recommended by NICE), only 55% of infected patients were found positive with the Two-Tier protocol. Therefore nearly half of infected patients will get False Negative laboratory test results, leading to substantial numbers of patients being denied diagnosis and treatment for their infection. It is 25 years since a World Health Organisation (WHO) workshop report recommended that testing for Lyme disease should employ multiple methodologies such as culture, FISH, PCR etc. (7) This is a rational approach which can compensate somewhat for the inadequacies of single method testing. The NICE guideline for Lyme disease is unreliable. It omits information which is essential to enable doctors to make informed clinical decisions. It confuses and invites inferences and assumptions, which will predictably result in iatrogenic harm to patients. 1. An Erythema Migrans rash might help to diagnose around 25% of patients with Lyme disease. 2. The C6 ELISA screening test has sensitivity of only 75% in patients with well defined Lyme disease. 3. Two-tier serology for Lyme disease has Sensitivity of only around 50% in patients with Lyme disease. 4. Doctors might find it helpful to consider if patients have tested positive with alternative, well proven methodologies, such as, Elispot, Culture, FISH, PCR, etc., as alternative test methods can support a clinical diagnosis and compensate somewhat for the gross insensitivity of serology for Lyme disease.